Combining the best of the humble American cheeseburger with the crispy deliciousness of Mexico! Dear Mr. President, can’t we all just get along and embrace our similarities AND differences? Take the humble cheeseburger, the most iconic American staple known to man. Beloved around the world and so ubiquitous that you can get it anywhere, no matter where you go. Then take the quesadilla that we love so much from our South American friends from below the border. A tortilla filled with molten cheese and lots of other different fillings that are at hand. The similarity with the grilled cheese sandwich is clearly undeniable. Why would we build borders instead of tearing down the prejudices and anxieties we have with other cultures? Let’s just embrace the similarities we share and leverage the things that indeed do make us different but complement each other. 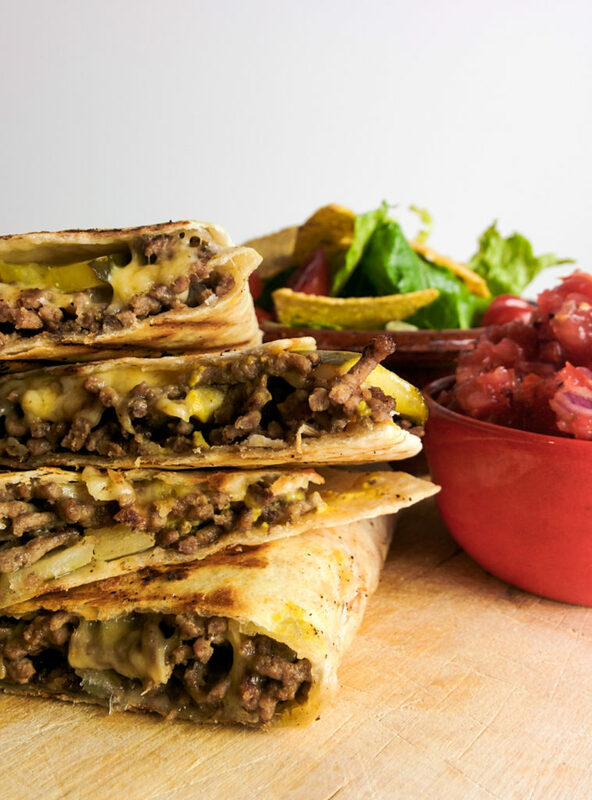 This cheeseburger quesadilla is my take on combining the staple American cheeseburger with the influences from the south. At first it seems a bit farfetched but at the end of the day it makes totally sense. It’s combining the old with the new and the foreign with the known. Caramelized beef with molten cheese, pickled gherkins, mustard and ketchup, all wrapped in a crispy tortilla rather than a regular old sesame bun. Too delicious and convenient to resist! Mr. President, instead of alienating what seems foreign, we should embrace it and try to fit it into our regular way of living. The world suddenly becomes a much nicer and tastier place to live in! Try this easy delicious Mexican fusion take on the humble cheeseburger and enjoy something familiar in a new and exciting way! Roughly dice the onion, finely dice the garlic. Put a skillet on high heat. Once the skillet is hot, add ground beef and diced onion. Fry for 3 minutes and keep breaking up the meat with a wooden spoon. Add cumin, diced garlic and Worcestershire sauce. Sit to combine and fry for another 2 minutes until meat is browned from all sides. Season meat with a generous amount of salt and pepper and remove meat mixture to a plate. No need to clean the skillet. Slice the gherkins. Place tortillas on your kitchen counter, spread mustard and ketchup onto them. Divide the meat mixture among the tortillas, but keep the meat on one half of the tortillas, leaving the other half empty. Sprinkle cheese on top of the meat and place sliced gherkins on top. Fold the tortillas over leaving you with 4 half moon shaped parcels. Place skillet back onto medium high heat. Add two quesadillas to the skillet and bake for 3 minutes until the bottom becomes crunchy. Flip over and bake on the other side for 3 more minutes. Repeat with the other 2 quesadillas. Cut each quesadilla into 3 pieces and serve them with salsa and salad! Let me know what you think of the recipes on the comments below! Do you like my twist on the regular old hamburger? Think something is missing? And on top of that, should I keep my liberal agenda to myself? Previous Post A fun week in Berlin with currywurst and other delicacies!